WILMINGTON — Following a series of probation violations this year, a local man convicted of burglary in 2014 has been imprisoned. 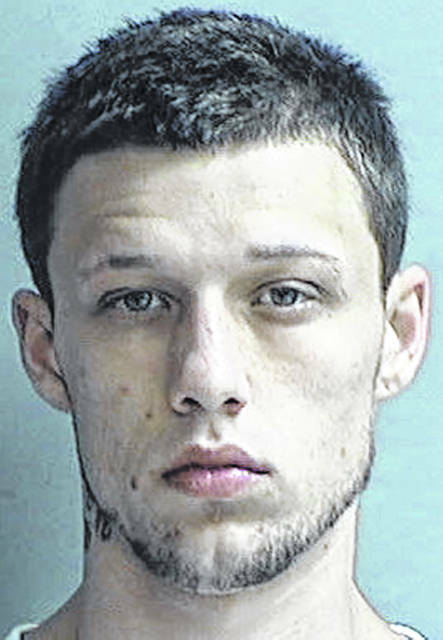 Jeff A. Corey Jr., 23 of Wilmington, was given a 12-month prison term, with credit granted for 233 days already spent in custody at the Clinton County Jail and the STAR Community Justice Center facility. The 2014 case involved convictions for grand theft, theft and burglary of an Ohio State Highway Patrol trooper’s home. The multiple items stolen were related to the trooper’s equipment such as his duty handgun, a taser stun gun, handcuffs, a chemical mace canister, and a two-way radio worth nearly $4,000. Just last month a co-defendant in the burglary, Russell Earl Cole Jr., 23 of Wilmington, had his lengthened term of community controls revoked and, like Corey, received a 12-month prison term. He received credit for 207 days already served in custody. According to a law enforcement affidavit, identification of the two burglary suspects was helped along by reports of multiple shots being fired in southwest Wilmington during the same time frame as the burglary. Investigation into the shots produced leads on suspects and witnesses, and Corey and Cole were identified and interviewed. Corey acknowledged he and Cole walked around Wilmington with the stolen taser gun and pistol, and that both men fired shots in town while out walking after the burglary. Corey said the burglary was preceded by heavy drinking, stated the affidavit. Corey originally was placed on community controls for a two-year term, and was ordered to pay restitution — as was Cole — in the amount of $5,852. He graduated from the STAR program in December 2014, and first violated community controls in April 2015 for failing to report to his supervision officer. In May 2015, Clinton County Common Pleas Judge John W. “Tim” Rudduck stated he would provide the defendant a second chance to apply the tools learned at STAR to his everyday decision-making. The period of community controls was lengthened and Corey was sanctioned with an additional 13 days in jail. He was warned that further violation of community controls could result in a 12-month prison term. He reportedly did not break any community control rules from spring 2015 until early 2018 when he failed to report to probation officers. Then in spring 2018, he was charged with domestic violence. In July 2018, Corey again was charged with misdemeanor domestic violence. Also in July 2018, he failed to appear in court for a hearing on a prosecution request to rescind the community control sanctions and replace them with a more restrictive sanction. Then, in late September 2018, with Corey incarcerated at the county jail, a drug screen was administered to him. He tested positive for meth, THC, ETG, MDMA, and amphetamines. A court paper states Corey admitted to using “Molly”. The synthetic drug MDMA is called Molly or Ecstasy, according to the National Institute on Drug Abuse. Upon release from state prison, the Ohio Adult Parole Authority will supervise Corey for three years. • Justin Mayer, 37, of Urbana, convicted of passing bad checks, received a suspended six-month jail term (18 days already served in jail on the case), and was placed on community controls for a two-year term. He was ordered to pay $5,050 restitution to Peoples Bank.